Organizational agility. Are you serious about it? Adam Singer shared his thoughts about how organizational agility benefits social media and marketing efforts. As I read his thoughts I couldn’t help but think about how much I agreed with him and have struggled to promote this concept in the work place. Organizational agility is easier in new or small organizations that either don’t have the staffing to promote extra processes or have not yet had time to establish layers of processes. But how does an established organization find agility since human nature is to add processes and approvals as time passes? To explore this question let’s first consider a few of the root causes of multiple layers of processes and approvals to get work done in an organization. One reason is to add a toll gate or checkpoint in a process after a failure. We want to ‘make sure that failure doesn’t happen again’ so we add a new checkpoint in the process. Another reason for overly complex systems of approvals and reviews is it protects those in power through organizational reporting hierarchy. It maintains the status quo! When one has organizational power they typically don’t like being by-passed in decisions of the organizations voice and output. Collins’ idea about a culture of discipline and an ethic of entrepreneurship are exactly what is needed within an organization to make it agile and nimble. Think about it. If the organization is aligned and the contributing members are working towards a common goal with the freedom to make decisions, then how much more would the organization be able to accomplish? 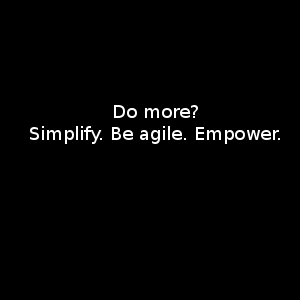 Call it agility, call it empowered employees, call it a culture of entrepreneurship. At the end of the day, it will accomplish more in less time. The great thing is that customers reward agile customer focus from informed and empowered employees. Employees are happier when they can do the work they were hired to do instead of spending half their time filling out forms or documents and waiting on approvals. It’s the great business paradox of our day: We want to be nimble and get things done faster, but we must follow all the process and bureaucracy in place to make it happen. I’d like to explore this topic further in future posts with some specific ideas about making an organization more agile to help promote eCommerce and Internet Marketing activities. Processes certainly have a place with the system of work output. But how can we make sure the process benefits us rather than owns us? « Water restrictions. Is anyone listening?